After looking at all the postings for Outdoor Wednesday there appeared to be an underlying theme — it's COLD! While this may not be exactly true here in Florida and a few other places, I must say that I haven't seen as much snow in the last ten years as I saw in blogland a few days ago. With that said, I decided I would share one of my favorite recipes to help warm up all my blogging friends. This is quick, easy and most of all — yummy! In a large stock pot heat beans and tomatoes over medium heat. Meanwhile, sauté onions in non-stick skillet in 2 tablespoons Canola oil until translucent. Add garlic and sauté for another minute. Add to beans and tomatoes. In the same skillet, sauté chicken pieces until cooked through, about 10 minutes. Add to stock pot. Add seasonings, stir well, taste and adjusts seasonings as needed. Simmer chili over low heat for twenty-five minutes. Add peach chutney and heat an additional five minutes. 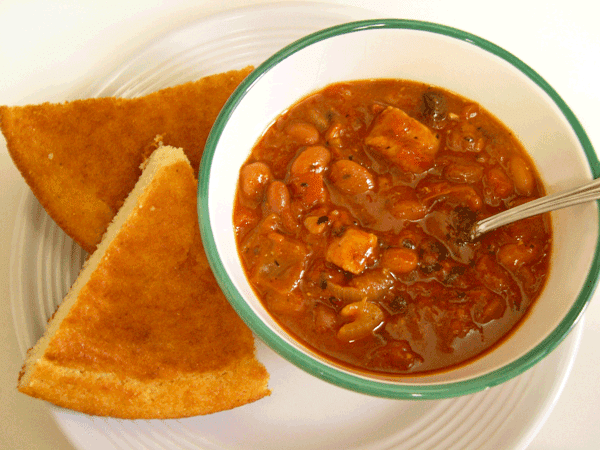 Serve in bowls with cornbread or crackers. Notes: You can substitute the beans and tomatoes with whatever brands are available at your local market, but I highly recommend fire roasted tomatoes for the best flavor. Add a can of diced chilies if they are not in the tomatoes you buy. 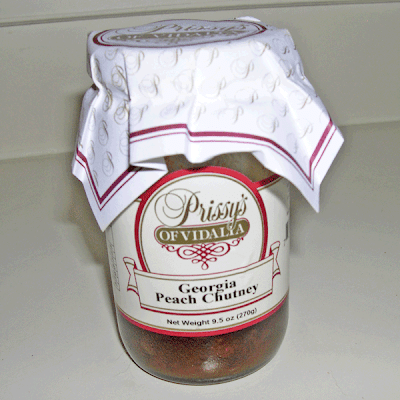 You can also use a mango chutney if you prefer, they have a good one at Trader Joe's. If you can't find the Cocoa Chile Blend, substitute with two teaspoons cocoa powder. I know a lot of people like shredded cheese on their chili and if you decide you must have it, use a white cheese like Jack rather than a cheddar. I prefer this chili without cheese. I made a big pot of this last week while my niece was visiting from South Carolina. She announced she didn't like chili, to which I thought, good — more for me. I was eating in my studio and when I emerged I discovered she not only had one bowl, she had two! I named this chili for a dear friend from California who passed away this past summer, Randy Hoffman. Randy taught me to experiment with my chili in an "anything goes" fashion. I don't make chili anywhere near as good as Randy's, but then, no one does. Randy had at least 35 flavors of chili in his repertoire, each was cooked at least 30 hours and was defatted 4 times in the process. Randy used only the finest ingredients and the flavors included Roasted Garlic Chicken (my favorite), Santa Cruz Pork, Gunslinger, Fusion Pepper Beef, Espresso Black Bean, Veggie Amor and Demon. Demon rated a 10+ on his heat scale of 1–10. I managed a restaurant in Los Angeles and we were at the time the #1 Breakfast Spot in Los Angeles. We served Randy's chili and people not only ordered it by the bowl, they put it in their omelets, on their pancakes, on their burgers and they ordered another quart to take home. Randy was the King of Chili and I'm not the only one who thought this. In the March 2009 issue of Bon Appetit Magazine, Chili My Soul (Randy's restaurant) was named one of the 10 Best Chili Restaurants in the United States (CMS came in #3). It was also named one of the Top 30 Restaurants in Los Angeles by the L.A. Weekly's esteemed food critic, Jonathan Gold. (Do you have any idea how many restaurants there are in Los Angeles?) 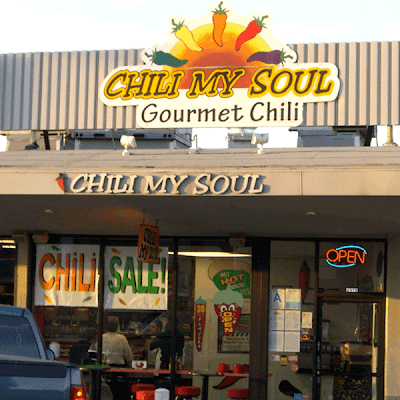 In December 2008, Esquire Magazine named Chili My Soul one of the 5 Best Chili Parlors in America. I could go on and on about the accolades Randy received for his chili, but to me, Randy was my friend and he will be missed. As I know you can all relate, Randy was my foodie friend and these days I have lots of new foodie friends who kindly share their recipes with all of us through our lovely hostess Michael over at Designs By Gollum. Be sure to stop by and click on the links. You'll not only find fabulous recipes, you'll also make new foodie friends! This sounds like a great chili, can't wait to try it! Enjoy the Season! I love that peach chutney is the secret ingredient. I am sure it adds a little something that makes all who taste it wonder. Thank you for sharing. That does sound like a yummy bowl of chile for a cold snowy day which we have. I bet it's even great in florida! Chili is great on those cold days. It's raining cats and dogs outside right now. I might just try this for dinner tomorrow. I immediately saved this recipe, although I have no idea where I'm going to find the chutney. I will try to look for something similiar on my trip...if I remember. 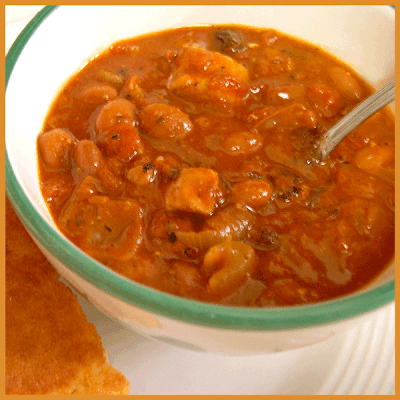 I'm a soup person and I don't have a good chicken chili recipe...this looks delish! Can't wait to try it! I can tell I'm going to love this recipe. It sounds scrumptious. I must also tell you how much I loved your tribute to Randy. Have a wonderful Foodie Friday. This is the perfect warmer-upper, and it looks so hearty and delicious. We are big chili eaters at my house during the winter, and this looks like a winner. The chicken and peach chutney sound enticing. Thanks, I’m always looking for something new and different. If you're fixing, Rhonda... I'll be RIGHT over! I love a bowl of hot chili on a chilly evening. And this the Chill to win the prize! PS Thanks for stopping by APOGEE Poet. Prayers and loving protection are here offered to your nephew. Please send his name onto me. I will pray for his safe return. We're freezing here in NY today -- it got so cold -- and I only had salad in the house. Sure can use that chili recipe. Thanks! -- Jane F.
I'm sorry about the loss of your friend Randy. What an amazing accomplishment -- to be singled out in LA as outstanding, in a city where even parking lots have little eateries in them. There are restaurants everywhere -- my daughter lives in Pasadena now, so I am getting familiar with southern CA, and I am stunned at the number of eateries in California. Do houses have kitchens? Randy must have been a special guy, and an extra-special cook! I'm so sorry for your loss, your friend Randy sounds like such a wonderful and creative soul. What an accomplishment to be acknowledged like that in your craft is such an achievement he must have been so proud. I was sad to see that the restaurant closed. It reminded me of what happens to a garden when the gardener passes away...they say the garden barely survives one year after the owners death..so sad..At least he will be remembered for being such a fabulous friend and cook. I will give this recipe a try. Thanks for sharing such a heart felt post. Hubby will not let me try a different chili recipe. The only changes to be made would be to try to get him to try a different dish. Once he has it one way, he doesn't want anything to change! I kill him when I alter my meatloaf. Can I come visit you and eat new things? It sounds yummy...Nothing better on a cold day..
That looks great. I love chili, but don't eat beef, so this is perfect. Thanks so much for sharing! 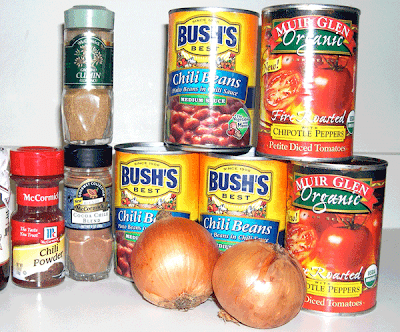 Believe it or not, I have just started using canned soy beans in my chili because they are low carb. Sounds yuck, but actually they taste okay. Not "yum" okay, but "this is different" okay. When I have hit my goal, I will go back to the good stuff in moderation- like not eating the whole pot in one day. Thanks for the great recipe! Wow! I'm so excited I found your blog. I just became a follower. I am a kindred tiki soul!! Your chili sounds great too! I'm just stopping by to say.... you "shell" too, Rhonda! Love that twist!! I'm sorry about your friend. What a great name for the restaurant. What a shame it had to close. That looks and sounds amazing, I wish I was a great cook like you! I must start practicing. Thanks for your nice compliment on my elevator and fashion interview...you always give such amazing feedback! Funny I was google imaging Chili My Soul and found this blog! I worked as manager for many, many years at Chili My Soul- was there almost 10 and miss my best friend every single day! Interesting that I was google imaging Chili My Soul and found this blog! I was the manager for many, many years and worked there for just short of 10 years. My best friend Randy is missed every day...and I make the chili quite often. This sounds like a very interesting chili!